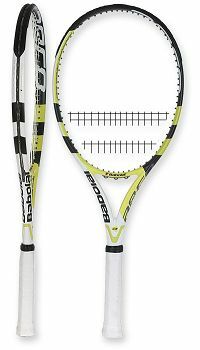 The Babolat AeroPro Drive racket is highly recommended for moderate to advanced baseline players who use a lot of spin on their strokes. This is the racket of choice for Rafael Nadal. The racket provides a lot of spin and control for ground strokes. It provides good feel at impact even for slightly off center hits. The racket provides good stability when volleying and does not swerve in your hand. You are able to hit crisp volleys. You can put away volleys with pace. The maneuverability of the racket at the net is not all that great. The racket provides good spin and power when serving. However, it is not all that great in helping you to get into a consistent grove with your serve. This racket provides good stability when returning hard serves. When you block a serve you are able to do this with control and depth. You also feel confident attacking on the service return as the racket gives you good control and power.